Elaine is a fully certified Authentic Pilates teacher through The New York Pilates Studio in NYC, the original pilates studio. 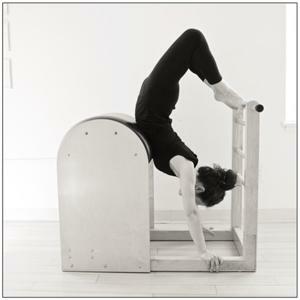 Elaine has been teaching pilates for the past 15 years in NYC, Brooklyn, Greenwich CT, and the Hudson Valley. She has studied and practiced pilates extensively through workshops and classes taught by renowned teachers of the Classical Pilates Method such as Sean Gallagher, Junghee Won, MeJo Wiggin, Bob Liekens, Steve Giordano, Leah Chaback Katz, and Pam Pardi, to name a few. Over the years, Elaine has grown the Rhinebeck Pilates studio to triple its original size and is a four-time winner of Best Pilates in the Hudson Valley by Hudson Valley Magazine. She often gives private lessons to apprentice teachers who are going through certification programs. She has written full-length pilates articles in a variety of magazines and online pilates sources such as Pilates Pro, Organic Hudson Valley Magazine, and Natural Awakenings Magazine. Click here to view media page. Elaine can be found on Pilatesology as the body for Sean Gallagher and Junghee Won’s tutorials. She also currently teaches twice a week in NYC at The New York Pilates Studio, and has taught both regular clients as well as Cirque du Soleil performers there. She also assists Sean Gallagher in running the Pilates Guild and its online store for selling archival pilates images. Elaine brings to her sessions knowledge not only from pilates experience but also from her extensive continuing education from attending workshops such as the Mount Sinai’s FAMI workshop, (functional anatomy for movement and injuries), and practice of the Alexander Technique, which she has studied with Hope Gillerman, Joan Arnold, and Judith Muir.